BDC 600 Reticle: Developed specifically for the trajectory of the .223 Rem 5.56 NATO round with 55-grain polymer tip bullet, the new BDC 600 reticle offers shooters unique open circle aiming points and hash marks from 100 to 600 yards. 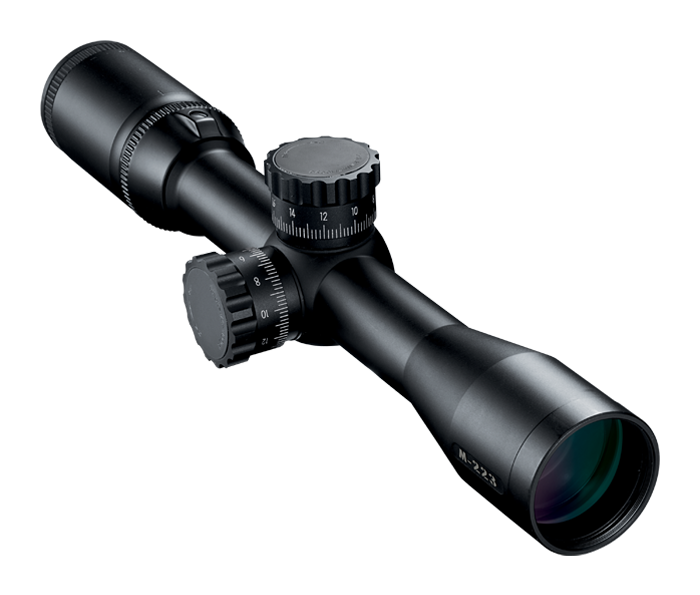 Ultra ClearCoat® optical system: Nikon has engineered the entire optical system to provide the shooter with a bright, sharp, incredibly flat sight picture and light transmission up to its theoretical maximum—95%. Eye Box technology: Every model features an impressive 4-time zoom range and four inches of constant, non-critical eye relief. A massive ocular lens delivers a huge, exceptionally bright, high-resolution sight picture. Smooth zoom control: Magnification reference numbers are viewable from the shooter’s position. One-piece main body tubes: For minimum weight and maximum strength and durability.